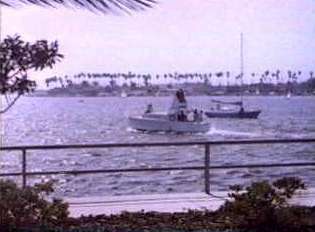 The Skipper, Jonas Grumby, and his first mate, Gilligan, had been running an excursion boat, the S.S. Minnow, from Honolulu, Hawaii, offering a three- hour tour that included a free lunch aboard the boat. On a Tuesday in September 1964, the Minnow left the Honolulu harbor carrying 5 passengers. The day the Minnow set sail, the radio operator issued weather information from the previous day, making no mention of the approaching tropical storm. When the Minnow got out to sea, the storm flared up, and the tiny ship was tossed. As the Minnow neared a reef, the Skipper ordered Gilligan to throw the anchor overboard, which Gilligan did--neglecting to make sure it was securely tied to the ship. The crew and passengers of the Minnow would have otherwise endured the storm and returned to Honolulu, but instead the Skipper lost control of the ship. Gilligan then threw the blowtorch overboard, and the ship's compass broke. In fact, Gilligan fell overboard, and the Skipper fished him out. After drifting at sea for 3 days, the Minnow finally picked up a current and drifted to the shore of an uncharted island that couldn't be found on any of the Skipper's Navy charts.